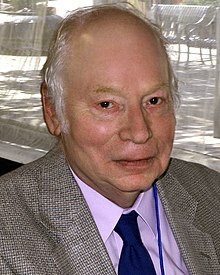 Steven Weinberg (born Mey 3, 1933) is an American theoretical pheesicist an Nobel laureate in Pheesics for his contreibutions wi Abdus Salam an Sheldon Glashow tae the unification o the waik force an electromagnetic interaction atween elementary pairticles. ↑ "Professor Steven Weinberg ForMemRS". London: Royal Society. Archived frae the oreeginal on 2015-11-12. ↑ "Claude Bernard - Department of Physics". ↑ "Dr. Raphael M. Flauger joins Department of Physics". ↑ "Steven Weinberg, Weak Interactions, and Electromagnetic Interactions". This page wis last eeditit on 16 Mey 2018, at 07:10.